EverBank, one of the banks that I talked about quite often here, has increased its bonus rate for its Money Market Account from 2.51% to 3.01% this week. The bonus rate is good for the first three months after the account is opened and funded. The current rate after the introductory period is 1.83%. EverBank has been one of the banks that consistently pay savers highly competitive rates. After this rate increase, yield of the Money Market Account is the highest among online savings accounts that I track. Combining the bonus rate and current rate together, the actual yield of the account is 2.00% APY for balance up to 50K in the first year. The yield isn’t as good as, say, that of Ally Bank Online Savings Account, which currently pays 2.25% 2.00%APY (see Ally Bank Review for details), but it beats many other popular banks easily. 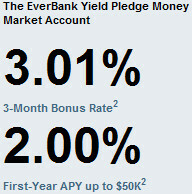 For more information, check out my EverBank Money Market Account review for details. In addition to the Money Market Account, EverBank has also increased bonus rate for its FreeNet Checking Account to 3.01% and the actual rate for the first year is 1.96% for balance between $50K and $100K. Go to my EverBank FreeNet Checking Account review for more discussions about the account. Oh man, I miss the days of 5% every day rates! Yeah, it will be a long time before we can see 5% APY again.